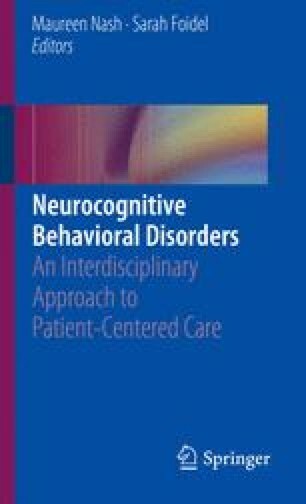 Major neurocognitive disorders cause complex challenges for the people diagnosed with them as well as those who care for them and about them. To fully support a person as they move through the trajectory of their disease, comprehensive care requires the most interdisciplinary integration possible. Evidence supports the use of an interdisciplinary team where possible especially for those with the most complex needs. This chapter explores advantages and disadvantages of different models of team care in the context of caring for someone with significant multimorbid disease which affects many different areas of brain functioning including neuropsychiatric symptoms. Specific communication tools that may be helpful to the interdisciplinary team are also reviewed. Bridges DR, Davidson RA, Odegard PS, Maki IV, Tomkowiak J. Interprofessional collaboration: three best practice models of interprofessional education. Med Educ Online. 2011;16 https://doi.org/10.3402/meo.v16i0.6035. Institute for Healthcare Improvement. Guidelines for communicating with physicians using the SBAR process. http://www.ihi.org/ IHI/Topics/PatientSafety/SafetyGeneral/Tools/SystemsAnalysisofClinicalIncidentsTheLondon Protocol.htm. Accessed 18 Nov 2004. Leavitt MO. Interim report to congress the quality and cost of the Program of All-Inclusive Care for the Elderly (PACE); 2009. https://static1.squarespace.com/static/57111ffc22482ed03d9f3a5d/t/5769b00f6b8f5ba0f5561480/1466544143650/Leavitt+Interim+Report+to+Congress.pdf. Accessed 27 Nov 2018. National PACE Association. Is PACE for You? 2018. www.npaonline.org. Last accessed 29 Nov 2018. Tsakitzidis G, Timmermans O, Callewaert N, et al. Outcome indicators on interprofessional collaboration interventions for elderly. Int J Integr Care. 2016;16(2):–5. Published 2016 May 16. https://doi.org/10.5334/ijic.2017. Zwarenstein M, Goldman J, Reeves S. Interprofessional collaboration: effects of practice-based interventions on professional practice and healthcare outcomes. Cochrane Database Syst Rev. 2009;(3):CD000072. https://doi.org/10.1002/14651858.CD000072.pub2.